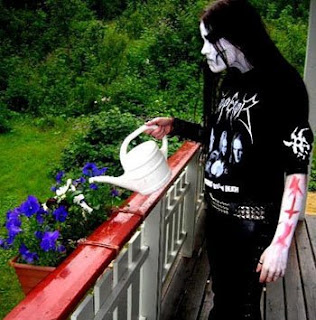 At least he looks suitably dejected while watering those very very colorful plants. I would like to note that while the goths and the tr00 black metal kids (he's wearing an emperor shirt) do have quite a bit in common in terms of their dress sense, they ARE two different subcultures. Still, it is an awesome picture. This! THIS!!! This is why I keep on checking every couple of days for updates. Priceless! I have second Amelia on those accounts. Yeah, I've pointed it out for MacMetal/Dimmu Burger guy, too. Please protect the pandas! Don't confuse them with our gothy friends! OOh! can I has one? Haha, ok, even though he's not a goth, this is priceless!